Etching by Antonio Fantuzzi, 26.5 x 53.7 L (Paris, Ed 8b Rés.). 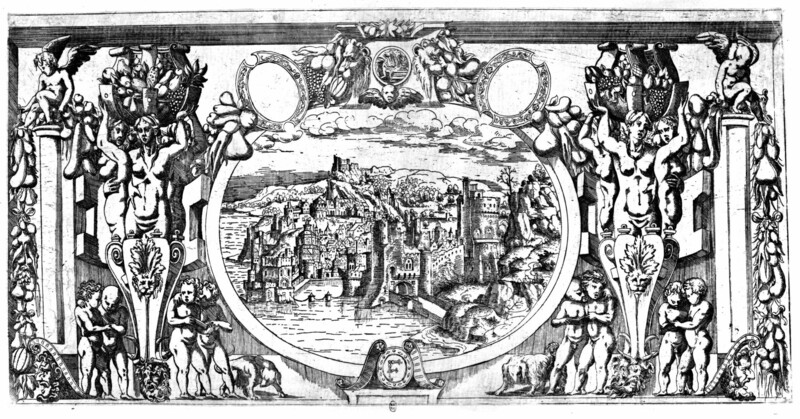 Inscribed with Fantuzzi’s monogram at the lower left. Bartsch, XVI, 1818, 352-353, 34, as Fantuzzi after a pupil of Primaticcio. Herbet, II, 1896, 269-270 (1969, 65-66), 3, as Fantuzzi after one of the frames in the Gallery of Francis I. Zerner, 1969, XLIII, A.F.35 (Paris), as probably 1543. COLLECTIONS: London, 1850-5-27-41 IMP. SIZE. 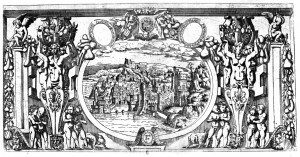 Paris, Ed 14d (Adhémar); Ed 8b Rés., no. 138. Vienna, Vol. XIII, Suppl., p.27. Berliner, 1925-1926, I, Pl. III, 2, Text Volume, 41. Adhémar, 1946, introduction, and Pl. VIII, top (Paris, Ed. 14d). Zerner, 1972, 115, Fig. 172. Béguin and Pressouyre, 1972, 132. Zerner, IB, 33, 1979, 253 (London). Carroll, 1987, 254, 256, n. 10, under no. 79. K. Wilson-Chevalier, in Fontainebleau, 1985, 132-134, no. 79 (Paris). 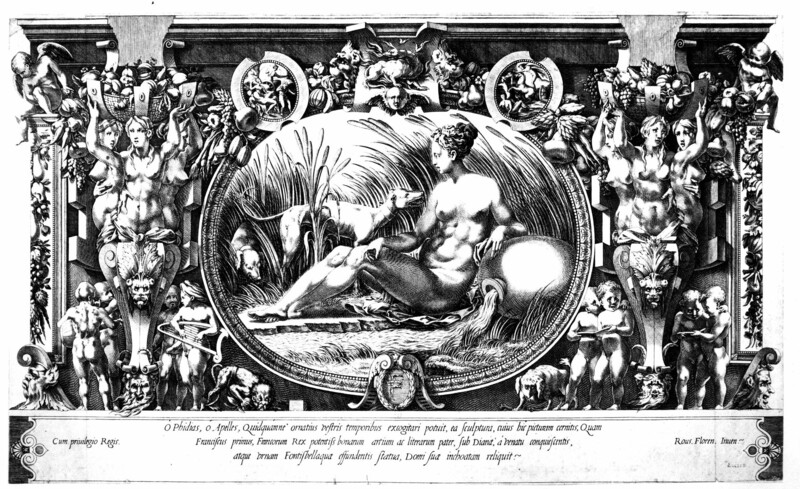 This etching is related to the framing of the Danaë in the Gallery of Francis I (Fig.P.22, IV S a). Fantuzzi’s print most closely resembles the left half of that frame with the singing children, which has then been more or less copied in reverse to form the other half of the etching. But the print has not been derived from the actual frame in the gallery, where no dogs appear next to the children, nor from the Milan-Boyvin print (Fig.E.103), where many details are different from what appears both in Fantuzzi’s etching and in the gallery. As indicated in the catalogue entry of the gallery (P.22, IV S), it is quite possible that the etching is based upon a lost drawing by Rosso. It could be that Fantuzzi had access to or used only half a drawing, which he then repeated in reverse to produce the whole image. But it is also possible that Rosso’s own first scheme for this frame was more symmetrical. Actually, Fantuzzi’s print is not absolutely symmetrical; the two dogs are not exactly the same and all the small details are slightly varied from one side to the other. The small oval areas in the print are blank, as perhaps they were also in the lost drawing. The salamander does not appear above. Instead, there is a small round scene showing a figure worshipping before an outdoor flaming altar. Flaming altars appear elsewhere in the gallery and it is, therefore, possible that this small detail in Fantuzzi’s print also goes back to the lost drawing, for it may be that at some early moment in the conception of the decoration of the gallery the salamander was not to appear above the central picture of every wall. DERIVATION PRINT: E.56,4. Du Cerceau, etching. Herbet, IV, 1900, 302 (1969, 152), V (Grands Cartouches, Second Set), 4. Among the variations, the F below has been eliminated and the small circular scene above has been replaced by a flaming salamander. But the salamander and the height of the volutes above the baskets held above the heads of the triads of women suggest that Du Cerceau also knew the Milan-Boyvin engraving (Fig.E.103).